8 January 2010, at 8:25a.m. MALAYSIA - One of the highlights of the recent Ross Middle East and Africa Association (RMEAA) Meeting, which took place in Malaysia, was a visit to Huat Lai, a long-established and successful Ross 308 customer. Huat Lai was proud to welcome the delegates to their processing plant, which is the newest and most advanced facility of this kind in Malaysia. In turn, Huat Lai delegates attended the RMEAA meeting in Kuala Lumpur and enjoyed spending time with the representatives from this region and learning about the success of Ross products in different parts of the world. 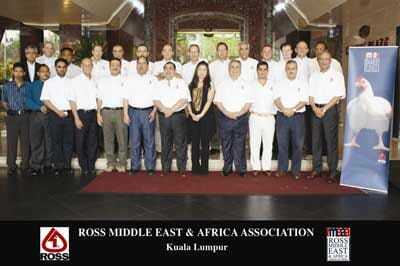 The RMEAA, which is made up of Ross distributors from Egypt, Iran, Iraq, Saudi Arabia, South Africa, Syria, Turkey and Zambia, meet every year to discuss commercial issues and devise strategies aimed at ensuring that Ross continues to be the region’s market leader. The meeting saw presentations on Aviagen's commitment to R&D, Aviagen India, the success of the Ross 308 in Asia, as well as providing each of the distributors with a platform to showcase their own markets. Dieyar Kakel from Rasun GP, the Ross distributor in Iraq, and Aviagen consultant Jim Johnston discussed customer value management and the importance of integration to GP distributors respectively. John Maguire, Sales Manager for Middle East & Africa, commented: "We are fortunate to be part of a global Aviagen network and to be able to call on the knowledge and expertise from our different regions. We are continually looking at the best ways of sharing information and knowledge to support our customers in the Middle East and Africa and highlighting the success of Ross products in different environments is a very useful tool. We are grateful that Huat Lai invited us into their wonderful facilities and shared their knowledge and expertise with us. "Our delegates also had the opportunity to get to know some of the Aviagen Asia team and to learn of some of the exciting developments in this ever-expanding market. We are confident that this mutual information-exchange and cooperation between the different regions will benefit our customers and ensure they continually receive the most up-to-date advice and new perspectives for their business." Yeow Her Lim, Managing Director, Huat Lai Resources Berhad, added: "We enjoyed being able to welcome the RMEAA and the Ross Middle East and Africa Team to Malaysia. The meeting was very interesting and we picked up a lot of useful advice and information. We are delighted with the performance of the Ross 308 in Malaysia and it is very encouraging to see at first hand the overwhelming success of Ross products in other parts of the world."